"On some level, each person skis alone." Stian Hagen grew up in Oslo, Norway. He competed in cross-country skiing and ski-jumping up to the age of sixteen before he decided that he wanted to pursue what was then known as extreme skiing. At the age of eighteen, he moved to Chamonix and quickly ticked off the classic extreme skiing lines, including the Mallory route on the north face of Aiguille du Midi and the East face of Matterhorn. 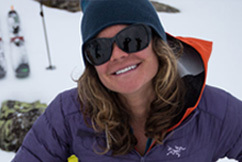 Born and raised in Invermere BC, Christina started skiing at the age of two. Eventually joining the ski-racing program when she was old enough, it was all progression from there. Competing on the Canadian Alpine Ski Team for six years, achieving top 10 World Cup results, and competing in the 2006 Winter Olympic Games were some of the highlights of her racing career. Paolo Marazzi grew up in a small town near Como Lake, Italy where he was introduced to skiing, hiking and climbing as a young child. Now, as an adult Paolo spends his time looking for big dumps of snow to ski in the Alps. His passion is telemark skiiing, and he has been competing in the ski event circuit in Italy for over two years. Born to parents who were both ski instructors, Hanna didn't have a choice when her father first put her on a plastic pair of skis at the age of 3. Going the way of a classic alpine ski racer until the age of 18, Hanna eventually developed a taste for adventure and started venturing on high alpine skitouring and freeride trips in the Suisse Alps, the Dolomites, Austria, France and the Bavarian Alps. Telemark and ski alpinism has been Conny's primary focus for more than 10 years. Touring the worlds most remote areas and many classic steep skiing descents throughout the alps, has turned what started as a hobby, into a way of life. Her true passion belongs to the winter days in her home village of St. Anton am Arlberg, where almost every day she can be found in the mountains. Gian was born in 1982 in Chur, Switzerland. The son of a Swiss mountain guide, he started skiing and climbing at a very early age. Accompanied by his father, Gian's first skitour and classic multipitch tour, was accomplished when just 6 years old. By the age of 9 he started snowboarding, which still remains as his passion today. Peter was born in 1976, started skiing when he was 3 years old and climbing at age 10 with his brother on a Rock in Haldenstein, Chur, Switzerland. 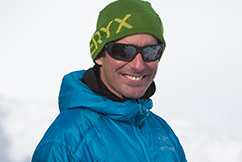 Now residing in Trin Mulin, Graubünden, Switzerland with his wife and two children, Peter works as a profession Mountain Guide, Ski Instructor, Paragliding Pilot and Canyoning guide. Born in the small Valley of Aran in the North Pyranese, David spent his childhood surrounded by mountains. His father, a professional mountain guide, David and his brothers spent their days skiing in the winter and walking in the summer. After passing through the snowboard phase for a while, David got his first fat skis and has never looked back. acob Slot's telemarking exploits have taken him to some of the most remote spots on the planet. He has skied major mountains in South America, Greenland, Spitsbergen, Japan and has numerous first descents throughout the Alps. He aims to keep pushing the boundaries of ski-mountaineering and continue exploring the world's most isolated mountain regions. Under the diffuse light of winter, wrapped in private thoughts and completely out of touch with the rest of the world, a person can drive for long periods of time in North America and be the only car on the road. In the Swiss Alps, where civilization reaches to mountain tops and cell service is rarely out of range, this is not what one expects to find. But it is possible. The Vereina Valley is just minutes from Davos and one of the biggest ski resorts in Switzerland. A popular hiking destination during the summer, during the winter months this valley has been the private cache of mountain guide and shepherd, Peter Guyan. 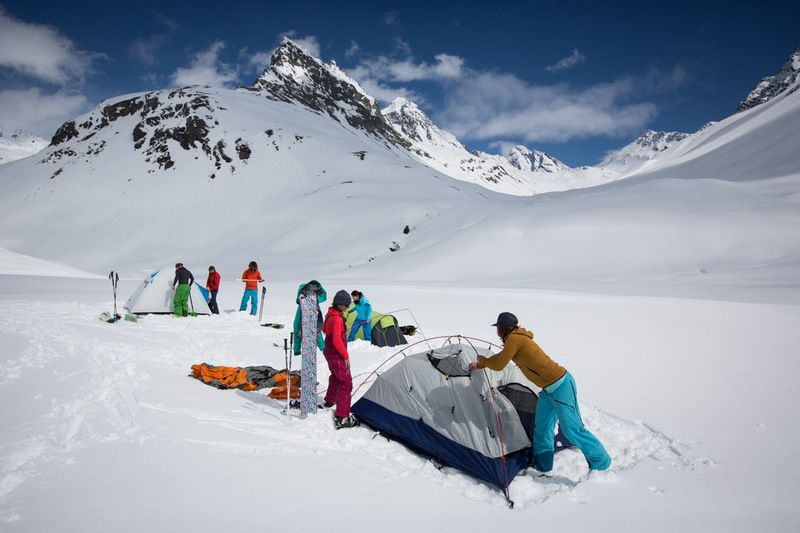 Last spring, Peter was asked to guide an international group of Arc’teryx athletes into his backyard plot of untracked north faces and couloirs. The trip was to unify the team, get some great visuals and to seek out a universal language behind the draw to go backcountry touring. The word remote implies distance; a lack of connection, an unlikely occurrence. By European standards, many of the places North Americans call home are remote. By the same token however, the Alps have critically vertical and intense conditions that cannot be defined as civilized. Perspective is everything. Peter first explored this valley while working as a farm hand on the mountain pastures. Amazed by the area’s vast ski touring potential, he wondered why it was ignored by backcountry skiers. Within striking distance of town, the area offered classic routes and a long list of opportunities for first descents. Miracles were harder to come by. So he studied the maps, he found the access and for ten years, Peter quietly skied a private, untracked mountain valley in the middle of Switzerland. And no one disturbed him. There is a fascination with history for me. How did this valley escape discovery? Skiers are similar in their love for speed and motion, but what they consider familiar can differ dramatically. One person’s backyard may be vast, buckled and formidable; another’s is calm steep trees. There is nothing that says backcountry terrain is necessarily quiet, unpopulated or remote. As the group gathered to begin their journey, within each individual was anticipation – for the unknown, for powder – but also for something private. Be it a form of solitude, being humbled by the scale and forces of nature, or a need for loneliness and absolute quiet. On some level, each person skis alone. The trip began at low elevation in rain. Peter’s access made use of a steep, volatile gulley, with a clear tendency to unleash huge wet avalanches. Metres of frozen debris made travel slow. The heavily loaded group negotiated the terrain in a cautiously spaced train, thoughts concentrated on the task at hand. They would be winter camping for a couple of days, making use of the shepherd’s refuge at 2000m only for cooking and route planning. Skiing in powder is like – 'pouf', everything else disappears. Your life is just in this moment. For some this degree of rusticity was normal. Others found it a challenge to be disconnected from any visible reminders of home. Storm clouds rose and fell; spectacular mountains appeared and were shrouded again. Christina Lustenberger: “Right away I felt small and disorientated in such a hectic steep place.” Jacob Slot: “There is a fascination with history for me. How did this valley escape discovery.” For David Sanabria, from Spain, everything was new. Morning dawned on Rosställispitz, the Unghürrhörner, the Plattenhörner, Gorihorn and Roggenhorn, fresh with 10cm of new snow. Peter divided the group into small, safe units. Tracks lead off in all directions. Out of sight from each other, the landscape easily absorbed them all. There was very little to mark their existence. Within each person was the challenge of something different than their usual, yet it was balanced with the essence of what backcountry means – freedom, the opportunity to play with a landscape and have all things mental and physical come together into one smooth ride. Once gaining my bearings, and with these like-minded people, I started to embrace the steepness and the exposure. Stepping off into the backcountry brings each person face to face with an interior challenge: how far is far enough. Is it important to see people or is peace found in knowing that not another soul will disturb your meditation. How much are you willing to unplug. There are as many draws to backcountry touring as there are people who venture off the beaten path. This group shared a common bond as skiers first, adventurers second. They were united by snow and open to wherever that took them. On the last day, Peter assumed the lead, choosing a route with a long ride out. Skiers’ silhouettes bounced and turned through pillows in separate white clouds of light and motion, completing a circuit that had little to do with distance and much to do with journey. Special thanks to Totti Lingott and Kay Helfricht (AlpS) for their contirutions.